This Saturday we welcome Marine to Marston Road in what is yet another “6 pointer fixture”. Marine are only 4 points above us, yet they had been putting a very good run of results prior to their home defeat to relegation threatened Workington. We need you as the 12th man to help us to another 3 points as we attempt to move away from the drop zone. Two weeks ago, we were overjoyed as our win over Bamber Bridge gave us not only 3 points but all the sides around us all dropped points. However, the reverse occurred last Saturday when after our hard-earned deserved point at Basford was overshadowed by all those around us picking up points. This shows how tight this league is and how “strange” results will happen over the next two months. As the season develops, we will often look back at what if’s, and our defeat at Marine last October certainly emphasises that. The game was heading towards a 0-0 draw when with a few minutes to go we were awarded a penalty and the chance to take 3 points. That spot kick did not go in, so it looked like we had lost 2 points. Sadly not, as a last-minute penalty to Marine saw us go home empty handed. In just a few minutes we had all the highs and lows as we had 1 point, then possibly 3, back to 1 and finally nil. 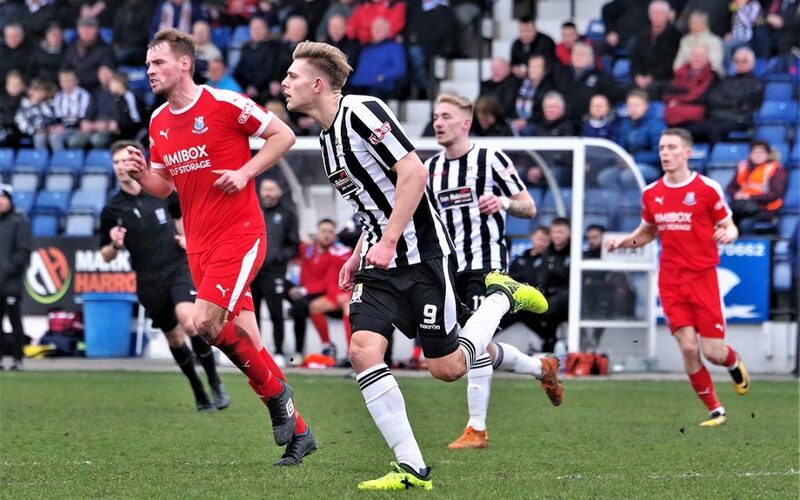 March could be a pivotal month for Stafford Rangers, as in the month we play the current leaders Warrington, home and away, go away to second placed Farsley and away to mid table Witton and Hyde. Therefore the 3 points we are after on Saturday could become essential. So please spread the word and lets get another big gate to cheer on the lads to the safety of mid table. 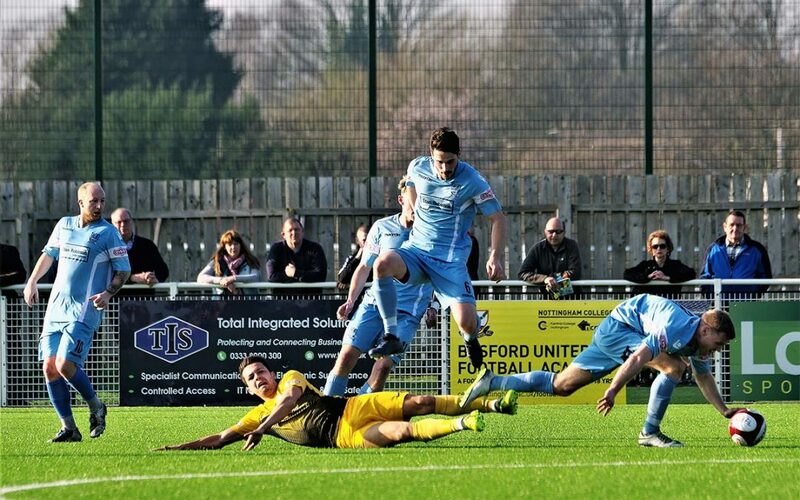 A late goal gave Stafford Rangers a deserved share of the spoils on the 3G surface of Basford United ending a run of three consecutive defeats on the artificial surface. It was Basford’s first home draw of the season. Rangers were unchanged from the side that beat Bamber Bridge a week earlier, apart from Andrai Jones replacing Louis Briscoe on the substitutes bench. When the two sides met at the same venue in an FA Trophy tie three months ago, Rangers were blown away as Basford raced into a three-goal lead inside 20 minutes. The Notts side found a different looking Stafford side this time around and one which was asking some questions of the home defence although it was Basford who came closest to an opener in the first 20 minutes. A long kick from home keeper Saul Deeley threatened to put Basford’s Shaun Harrad in but Stafford defender Dan Burns did well to hold him off and get the ball back to Adam Siviter. Siviter was in the action again when he failed to take Nathan Watson’s dipping cross, but he recovered in time to dive on to the loose ball. But it was James Reid’s free kick on 19 minutes that came closest to a goal – the ball striking the Stafford wall before looping over. Rangers’ first serious effort came a couple of minutes later when a good ball down the line from Theo Bailey-Jones found Jake Charles who, in turn, spotted a run from Jack Sherratt but the midfielder’s shot went the wrong side of Deeney’s right hand post. Soon after, Sim Thandi curled one over after an exchange of passes with Charles then Joe Cuff went just wide following Thandi’s lay off. A good move from the home side saw Fernando Bell-Toxtle put in Zak Goodson but he was denied by an important challenge from Burns. The deadlock was finally broken with a superb strike from Bailey-Jones on 33 minutes. Cuff found his man wide on the right after just winning the battle for a 50-50 ball and Bailey-Jones let fly with a shot across Deeley and inside the far post. Basford went close to an equaliser on the stroke of half time when Watson flicked Reid’s free kick on to Liam Bateman but Siviter saved well with his body. Bailey-Jones missed a great chance to increase Stafford’s lead early in the second half when he blazed over from close range following Matt Hill’s cross. A minute later, Tom Thorley filed to shoot when the opportunity arose on the edge of the area. They were costly misses as Basford, boosted by sub Liam Hearn, levelled on 65 minutes when Matthew Thornhill’s ball found Jack Thomas and he created himself a yard of space to fire smartly past Siviter. Basford went in front three minutes later; Reid’s free kick was met by a glancing header from Shaun Harrad and Siviter’s best efforts were to no avail. Stafford should have been awarded a penalty on 74 minutes when Thornhill handled inside the area, but referee Richie Watkins waved play on. Basford controlled the final 15 minutes to repel almost everything that Stafford had to offer. Rangers should have levelled in the final minute of normal time when Ben Mills skewed wide when well-placed, but the visitor’s persistence paid off and they grabbed a share of the spoils in the first minute of added time when Deeney’s save to deny Bailey-Jones rebounded into the net off Basford defender Dominic Roma. 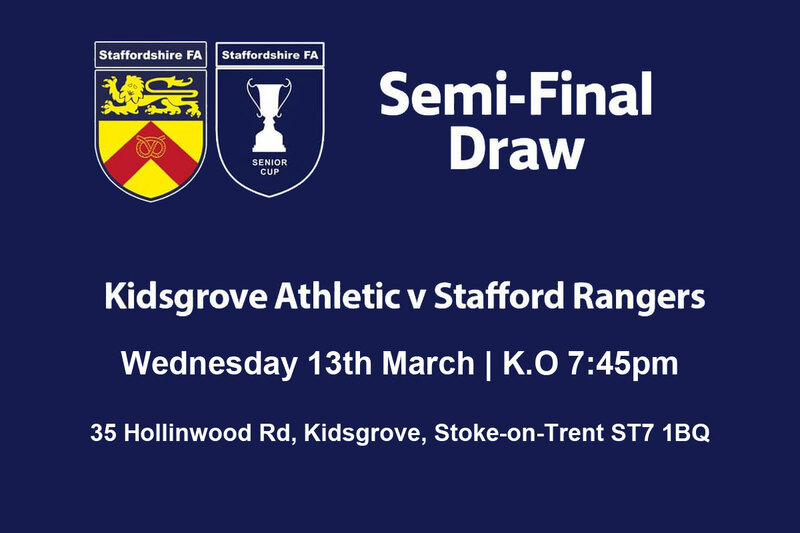 Staffs Senior Cup – Semi-Final Draw! Next Saturday we travel to Basford, a suburb in North West Nottingham. How can I persuade fans to travel to this game? 1. They play on a synthetic pitch. 2. They have already beaten us 4-0 on that pitch in this seasons F A Trophy. That aside we will travel in hope of getting something out of this game, so there is every reason to travel to this game to support the team. Basford lie 7th in the league with 47 points from their 30 games. At home they have won 11 and lost 4. They have yet to register a home draw. I think many of us would be happy with a point. Strangely, Basford have scored 67 goals but conceded 55. We too have conceded 55 so while they tend to win well at home they do not appear to travel well as our 3-1 win in September over them will testify. It would be a great result if we could break our duck on synthetic pitches, especially as we still to travel to Hyde. Basford started this season, their first at step 3 in very good form but experienced a blip either side of Christmas. December saw 2 wins and 3 defeats in the league while January saw 1 win and 4 defeats. Their one win was a 2-1 at North Ferriby while one of the defeats was an alarming 8-3 reverse at home to Hyde. Sadly, as we arrive, they have won both of their February games. Although a very young senior non-league club, Basford were formed in 1900, but played mostly in local Nottinghamshire Leagues. 1991 Basford moved to their current ground. In 2006 they joined the Notts Senior League. In their first season they finished 3rd. The next few seasons saw them come 5th, 3rd, 2nd and 2nd. In 2011-12 they won the Central Midlands League South in their first season in the competition and this success earned them promotion to the East Midlands Counties League for 2012-13 where they again ran out champions, setting a record points total as well as becoming the first club to complete the EMCL League and Cup double. That saw promotion to the Northern Counties East League Premier Division, where they finished in a creditable fifth place in 2013-14. That was to be their only season in the NCEL as they were moved into the newly formed Midland League Premier Division for 2014-15. This was to prove a memorable season for the club as they won the Premier Division in some style, finishing six points clear of their nearest challengers and winning the Notts Senior Cup for the first time in 27 years. The Midland League success earned the club promotion to the Northern Premier League Division One South, and then a further promotion to the Northern Premier League. Other than the FA Trophy game this season our only other visit to Basford was our league 1 championship season of 2015/16 when we played out a 1-1 draw. Again, such a score would go down well with us this season. So, get behind the team and travel to this fixture. Our synthetic pitch hoodoo must come to end sometime. Basford play at Greenwich Avenue, Nottingham, NG6 OLD. Admission is, Adults £9, Concessions £6, and under 16s £2. For those travelling by train there are frequent services taking about 90 minutes changing at Tamworth for around £30 return. To get to the ground from the city centre take any tram to Phoenix Park or Hucknall and alight at Highbury Vale tram stop for a short walk to the ground. Stafford Rangers picked up their first home win in two months in a tense battle against Bamber Bridge, a win that was enough to lift them above local rivals Hednesford Town in to 18th place. Rangers recalled Joe Cuff to the starting line up with new signing Paul Bignot taking a place on the substitutes bench. Missing from the 16 who lost at Scarborough a week earlier were Jed Davies and Andrai Jones. There was a minute’s applause before kick off as tribute was paid to the late Gordon Banks and it was somewhat fitting that the two keepers on show in this Evo-Stik League encounter should put on a fine display to keep their respective sides in the contest. Bamber Bridge’s Lloyd Rigby was easily the busier of the two in the opening 45 minutes – a half dominated by Rangers – although he only made one significant save and that from the head of one of his own team-mates. Rangers went on the attack from the start and, in the 3rd minute, a good ball hooked through from Jake Charles sent Cuff away in the inside left channel, but the young midfielder skewed his shot wide of the target. Five minutes later, Charles himself went wide from around 25 yards after Tom Thorley’s long throw had put the home side under pressure. Theo Bailey-Jones was next to have a look in, but he failed to produce the goods from the edge of the D after getting into a promising position. But, the early pressure finally produced some reward in the 11th minute when another Thorley throw fell to Charles with a yard of space, he made no mistake. Cuff missed out on another good opportunity when Luke Jones’ long ball had Brig’s Matt Lawlor beaten – this time the Rangers man was unable to get in a shot and Rigby gathered up. A late challenge on Matt Hill by Danny Forbes earned the visiting midfielder the games’ only caution and from the free kick, only a fine tip over from Rigby prevented Forbes from heading into his own net. Brig were always going to have their moments although they were few in the first half. Dan Burns made a good block to deny Alistair Waddecar – he scored four goals in his side’s 6-1 win when the two teams met earlier in the season – but it was Lawlor who squandered their best opportunity when he skied over following Matt Dudley’s free kick. Having dominated so much of the play, it was appropriate that Rangers would end the half on top, but they went in at the break with just their one goal advantage after Cuff missed another two chances that fell his way while Burns’ header landed on the roof of the net. Whatever was said in the visitors’ dressing room during the interval must have hit home as Brig were the first to show at the start of the second half. They should have levelled just a couple of minutes after the restart when recent signing Scott Harries was put in by Waddecar, but he was denied by the feet of Rangers’ keeper Adam Siviter. Stafford responded and Rigby tipped another over his crossbar – this time from Bailey-Jones, then, an error from Callum Spooner opened the door for Rangers once more before Lawlor made an important tackle to halt Charles. Rigby was Brig’s saviour again when he raced out of his area to beat Cuff to a pass from Charles while Thorley skied over from Charles’ lay off. But the visitors were still in the contest and piled on the pressure in the closing stages and Waddecar struck the post from a tight angle after a good ball from Harries. A couple of minutes later, it was Stafford’s turn to be denied by the framework as Rigby somehow managed to get a fingertip to divert Andy Haworth’s rocket shot on to the crossbar. The Stafford sub is still searching for his first goal for the club having been on the scoresheet against Stafford when playing for Brig earlier in the season. But it was Siviter who produced what was ultimately the match winning save as he kept out Waddecar with a couple of minutes remaining after the Brig veteran was clean through.